On November 8, Ambassador Liu Xiaoming was invited to attend the reopening ceremony of Sir Joseph Hotung Gallery of China and South Asia at the British Museum. Her Majesty The Queen reopened the Gallery and viewed a few highlights of the display, including the relics from the Ancient Silk Road, jade, porcelain, paintings and etc.. More than 200 guests attended the ceremony, including Deborah Bronnert, Director-General of Economic and Global Issues of British Foreign & Commonwealth Office, Sir Richard Lambert, Chairman of the Trustees of the British Museum, Hartwig Fischer, Director of the British Museum, Lord James Sassoon, Chairman of China–Britain Business Council, Lord Powell, former foreign policy adviser to Prime Minister, and other celebrities from various communities and Asian diplomatic corps in the UK. 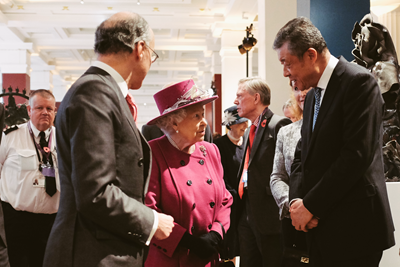 At the ceremony, Ambassador Liu Xiaoming had a cordial conversation with Her Majesty. By reopening the refurnished gallery 25 years after personally inaugurated it, The Queen was showing the great importance she attaches to UK's cultural exchanges with China and other Asian countries, said Liu. He believed that the Galley would make a new and greater contribution to promoting exchanges and learning between Eastern and Western civilizations. The Queen gave her endorsement to what Ambassador Liu said. The British Museum, with a collection of 23,000 Chinese cultural relics, houses the largest number of Chinese treasures overseas. With the funding of Sir Joseph Hutong, a Hong Kong businessman and collector, the Museum set up Sir Joseph Hotung Gallery of Oriental Antiquities, which was unveiled by Her Majesty The Queen on November 9, 1992. As one of the 10 specialized departments of the British Museum, the Gallery focuses on the collection, protection, repair, research and display of artifacts from Asia. Currently, more than 2,000 pieces of Asian artifacts are on display, including stoneware, bronze ware, jade, porcelain, lacquer, murals and statues from 5000 BC to the present, half of which are from China. In June 2016, the Gallery was closed for renovation and restoration. On November 8, 2017, it reopened to the public as Sir Joseph Hotung Gallery of China and South Asia, with calligraphy, painting and silk items, as well as the Gallery's new collections of contemporary Chinese jade, lacquer and porcelain added to the original display.